The Illinois Real Estate Salesperson Exam is given in two different sections. The first section is the real estate salesperson national exam. 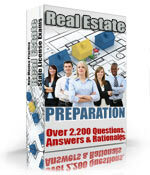 The second section is the real estate salesperson state specific exam. The national part of the Illinois Real Estate salesperson test consists of 100 questions. In order to pass the exam, an examinee must answer 75 out of the 100 questions correctly (75% correct). The time allowed to complete the Real Estate salesperson National Portion is 2.5 hours, if taken by itself, and 3.5 hours when taken in combination with the state portion. The state specific portion of the Illinois Real Estate Salesperson Exam is comprised of 40 questions. An examinee must answer 30 questions correctly to pass (70% correct). The time allowed for the state specific part of the Illinois Real Estate Salesperson Exam is 1.5 hours, if taken separately, or 3.5 hours if taken combined with the national portion. In Illinois, if you pass one part of the Real Estate Salesperson Exam, you are permitted to take the subsequent part at a later date, as long as both are passed within 12 months. The Illinois Real Estate Salesperson exams are taken by computer. You will receive your results after finishing the exam. The exam is closed book. You are permitted to bring a simple functioning calculator since about 10% of the exam questions involve math. Remember to bring two forms of ID to the test. Also, be prepared to have a finger print scan. Do not arrive at the exam site later than 15 minutes after the start time, or you will not be admitted. Be prepared and arrive early. The registration fee to take the Illinois Real Estate salesperson exam is $46.